The latest Springblade running shoes by Adidas are indeed ‘loaded with springs’ and literally provide the wearer with such a unique feeling. A pair of these innovative running shoes puts your feet atop 32 polymer blades that are designed in a way to thrust you forward as you run. These sneakers also provide a sense of buoyancy to the wearer, even whilst walking- which perhaps is a unique enhancement to running shoes. 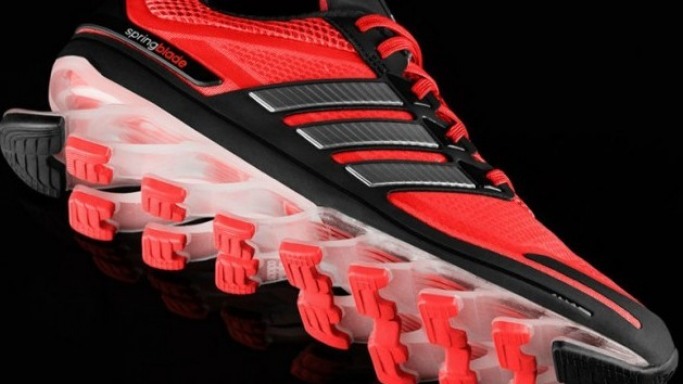 Not only do the latest Springblade shoes provide a unique running experience, by providing optimal energy returns, but they also have a very different and innovative look as well. As stated by Mikal Peveto, who is responsible for Adidas North America running products:"They have one of the highest energy returns that we've tested. What's unique is that they don't return energy vertically; they return it horizontally." This means that these sneakers are designed in a manner that when pressed down, the springs propel the wearer forward instead of upward, hence making Adidas the first brand to provide horizontal propulsion. Looking at the structure of the shoes with their cantilevered blades, one is bound to feel that it looks imperfect as they are less than a quarter of a inch thick in some places. A major part of the sneakers is sustained by seven pairs of smaller-sized blades with two larger sized blades covering the entire front and entire back of the shoes. The Adidas Springblade shoes would be available in retail outlets in August this year. The shoes have already gone through the various stress tests in which real-world test runs were conducted over thousands of miles and numerous vertical compressions were applied on the blades. Despite the rigorous testing, the blades still upheld their shape and displayed great durability under such rigid testing conditions. Due to the forward spring motion provided by the blades, these shoes are optimal for linear movement like running and are not suitable for sports like basketball which involves multiple motion. Adidas, like always, is keen on changing the way people run and these pair of sneakers will definitely increase the speed, comfort and thrill of running long lengths- making it much more effortless and enjoyable. A lot of hype has already been created around the latest Adidas shoes sensation. These revolutionary running shoes would be priced at $180 and are the perfect footwear for running enthusiasts.